Yummy! And very well composed. I like the bubbles, they add to the photo. Hey! A fellow Oreo lover! Nice shot! I had given it a 9 - it's a really good macro. Interesting and detailed, this pic is great. Exceptionally well composed image. Great technically. This will be a top finisher. cute concept. nice, clean composition. No cookies were harmed in the making of this picture, right? Great photo, right side lighting is great, the bubbles are absolutely purfect. My only complaint is that you should not have gotten the top of the oreo wet, it would've had better contrast the other way. nice.. would be interested to see it in colour.. This is a good photo. I don't think an oreo in milk is really an oops though... ;) I like the contrast of the orea and the milk, and setting the oreo off-center. Mmmmm, I want oreo now. 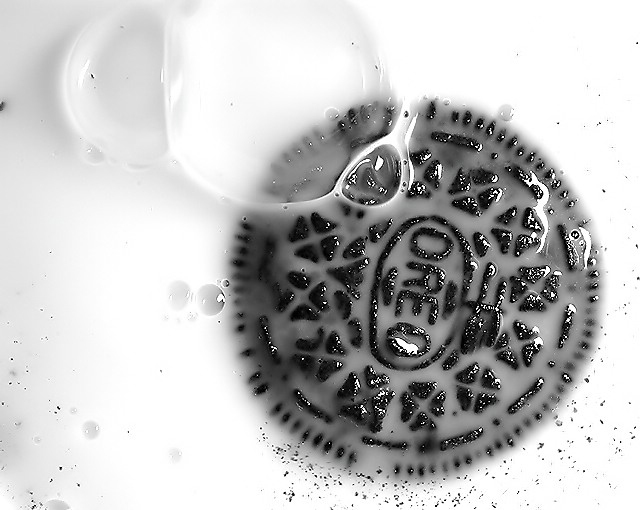 Good captuer of the milk and oreo, Nice composition. Proudly hosted by Sargasso Networks. Current Server Time: 04/18/2019 07:11:09 PM EDT.